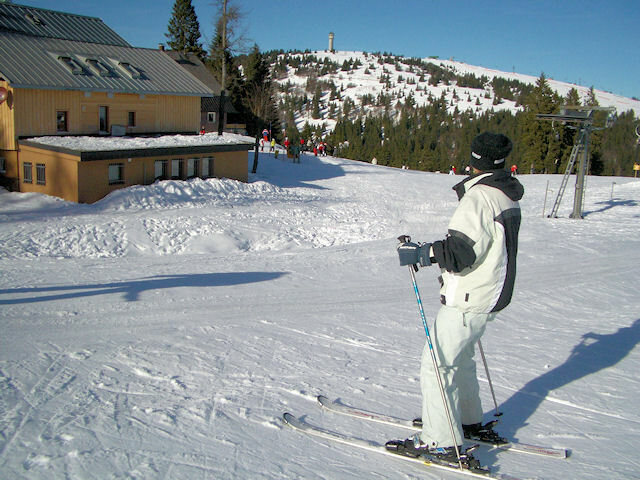 ermany's largest winter sports resort outside the Alps, Feldberg is the highest point in the Black Forest. it is popular with weekend skiers so parking can be challenging (unless you arrive early) and queues can also build up on the lifts - although they are rarely long. 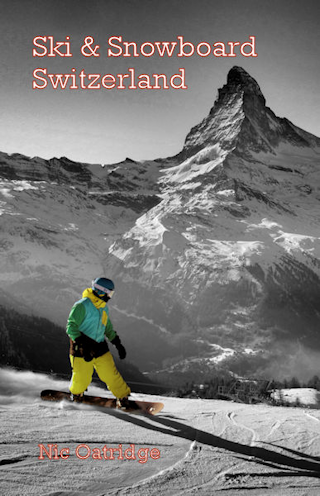 Generally this is an excellent resort for beginners and intermediates, but there is a tough FIS World Cup run too. Interestingly enough Feldberg seems to be popular with many skiers and snowboarders from Belgium, Holland and North Germany - for whom it is an easier trip than the Alps - and there are wide range of other activities to do in the area, from spas to snowshoe walks. There are some smaller, low-lying pistes dotted around the Southern Black Forest but the main pistes are concentrated around the Passhöhe in Feldberg. The bottom station of the Fahl chairlift provides basic facilities, including a ticket office, restaurant and hire shop, and there are more extensive facilities available around the Hebelhof and Feldbergerhof stations - there are (English-speaking) ski schools, hire shops, ticket offices and numerous restaurants at both. The pistes of both areas are loosely connected by a ski bridge over the main road. The runs at Feldbergerhof are spread along a wide field with some sections nominally graded red and some blue around an impressive park. From the top you get some glorious views across the Black Forest, but it can get very chilly above the tree line. The runs at Hebelhof are more interesting, more sheltered, more challenging and more varied. You can't entirely avoid surface lifts if you want to explore all of the resort, but it is possible to access most of it without doing so, particularly if you start your day at Feldbergerhof and end it at Hebelhof. 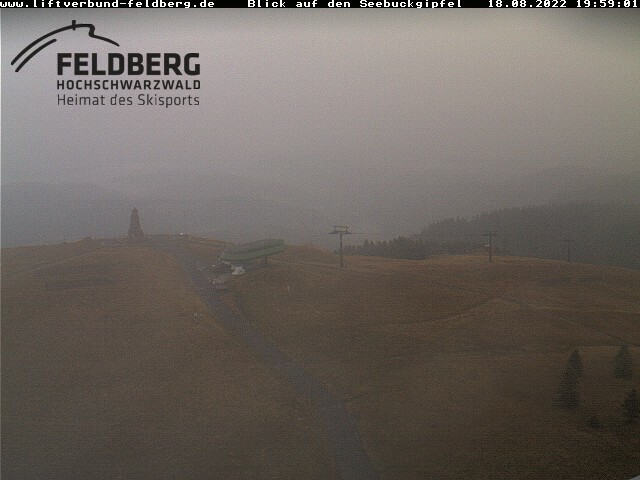 The best destination to access the downhill slopes by public transport in this ski area is Feldberg, Feldbergerhof. Web sites may try and route you Freiburg, but from the South it is easier, more convenient and cheaper via Zell and then on bus line 7300. 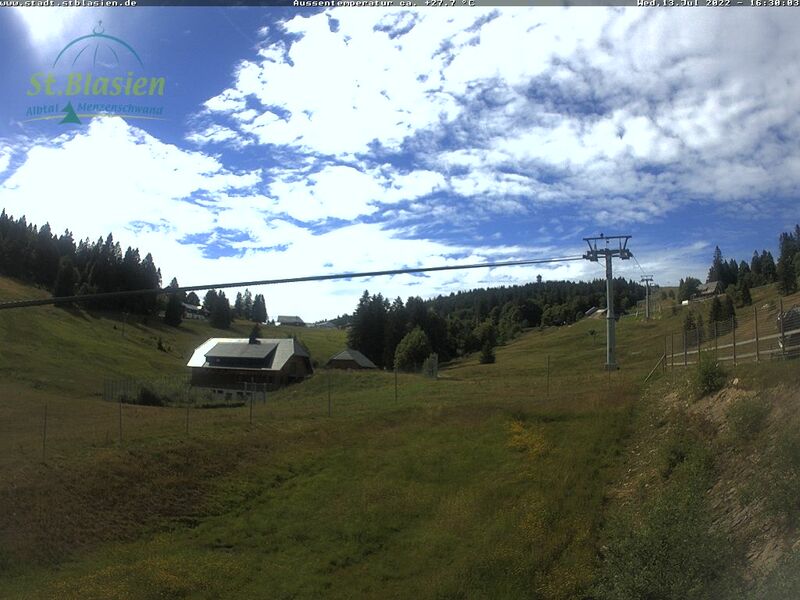 If you do go from Freiburg go via Titisee, alight at Feldberg-Bärental and take the Zell bus (line 7300). 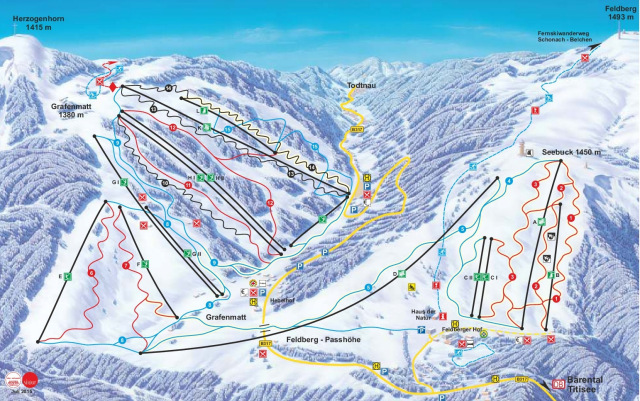 The stops in the resort are Fahl skilift, Hebelhof and Feldbergerhof. From Basel the least travel time is 1 hr 45 mins with as few as 1 changes going via Zell (Wiesental). Arrive early at weekends to secure a decent parking place. The road distance from Zurich is around 100 km and the journey time is roughly 1 hr 36 mins. The road distance from Basel is around 73 km and the journey time is roughly 1 hr 10 mins. The road distance from Berne is around 242 km and the journey time is roughly 2 hrs 5 mins. The road distance from Geneva is around 295 km and the journey time is roughly 3 hrs 30 mins. $$$ Feldbergerhof, Feldbergerhof Family hotel, right next to slopes.